Beth came to Drummond Central as part of the first class to join the School of DC programme. Almost one year on she is now working as a Graphic Design and Communications Officer at County Durham and Darlington Fire and Rescue. We are extremely proud to see her killing it out in industry. Hey Beth, how are you today? Hello – I’m great thank you. It’s been almost a year now, but what do you remember from your time on the School of DC programme? Nearly a year, really? Time has flown by, but it seems like just yesterday I was at DC. I had the best time – I have to say, the first school of DC had the best classmates. Being an original, what was it that made you apply for the School of DC? Well, Katy (my creative partner at the time) and I, had a book crit with Creative Director, Stephen Drummond. He mentioned it to us and we jumped at the chance to get our teeth into DC. 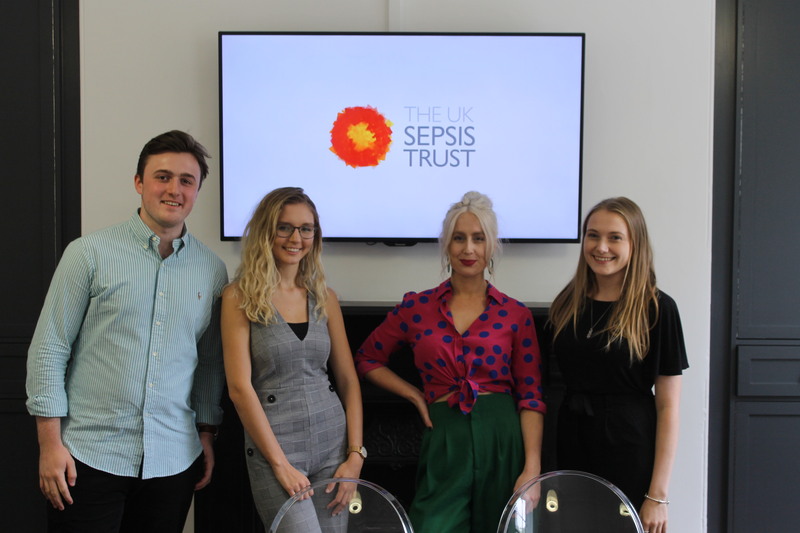 Your creative brief was on the UK Sepsis Trust. What did you think when you first got the brief? To be honest, wow. I hadn’t really heard much about sepsis before, so it was quite overwhelming to start with. Also, I knew how much the topic meant to everyone at DC, so it was so important for me to really put 110% into what I did. What did you take away from your two weeks with us? I don’t know where to start. I felt like I learnt so much within those two weeks. Every day there was something different for us to join in on, whilst also working on our brief. From chats with the people of DC to the best adverts being played at Lunchtime Loops in the boardroom, and grammar lessons with Dan Brough. It was all fantastic, and I learnt so much. Do you have a standout moment from your time with us? It has to be the feeling of pitching our ideas to the agency. Although it was nerve-racking, it was also so much fun for us to show some amazingly creative people what we’d come up with, and for us to get such a great response about our campaign ideas was just the icing on the cake. So tell us about your job. I absolutely love it. I take part in a variety of things, from going out and taking videos for the service to creating in-house videos that are used on their social media platforms. Every day is different and I’m able to use my creativity every day which is just the best. After two weeks of solid graft, we wanted to show you guys that we know how to celebrate. How did you find your graduation night? After working with such a great bunch for two weeks, it was fantastic to see everyone let their hair down and have a few drinks together. I have to say, the first sip of that Kopparberg felt well-deserved after how much work we put into our time at DC. It was such a fantastic way to round off an amazing experience. Can you sum up Drummond Central? And finally, what’s the one piece of advice you’d give to someone looking to join our class of 2019? GO FOR IT! It’s been one of the best things I’ve ever done, and I’ll guarantee you’ll learn so much in such a short space of time. If you think you could take on the School of DC, don’t miss your chance to apply. Head over to schoolof.drummondcentral.co.uk today, the deadline for applications is April 30.